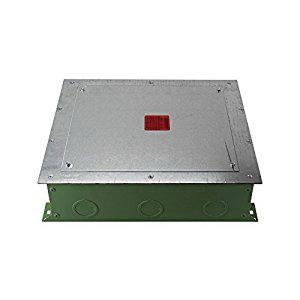 Wiremold on-grade 9-Compartment floor box is suitable for concrete floors. Recessed floor box features steel construction. Rectangular floor box measures 14-3/4-Inch x 12-5/8-Inch x 4-1/8-Inch. It has 43-Cubic-Inch capacity. This floor box has 3/4 - 1-1/4-Inch knockout. It offers additional space and flexibility for both power and communication cable egress. It comes with mudcap to prevent entry of concrete during pour. Floor box is UL listed and RoHS compliant. * Inventory displayed is accurate as of 04/22/2019 03:40 PDT.